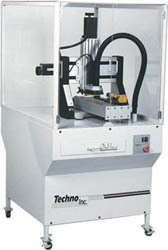 The stepper DaVinci is a small machine driven by stepper motors. Stepper DaVinci g-code interface - This document covers the software interface for controlling your router. Educational DaVinci Setup - good for Education, but also everyone else. For troubleshooting help with the Stepper DaVinci, download the Stepper DaVinci troubleshooting guide. If you suspect misalignment, consult the Alignment Procedure document. Download the Spare Parts List for details.